​With so many cat food brands out there and tonnes of different products, it can be extremely confusing for cat owners when trying to select and buy the right product. ​There is lots of conflicting information online which makes this process even harder! So, in these set of reviews, I aim to dig a little deeper, taking a look at some of my favorite brands to help cat owners make better (more informed!) decisions. Today, I am taking a look at Natures Variety Cat Food and their selection of recipes. Nature’s Variety is an independent pet food company based out of St. Louis in Missouri (USA). So, Which Natures Instinct Cat Food Is Best? Natures Variety have a simple mantra that is health orientated – “the best nutrition comes from healthy, natural ingredients“. 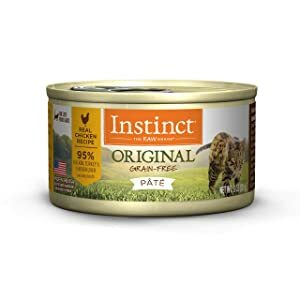 Interestingly, the company has a couple of different lines of products, but their main line for cats is “Instinct Foods”, which has been around for some time. This particular line includes raw frozen diets, kibble, cans, biscuits etc. Nature’s Variety respect the fact that cats are (and always will be!) meat-eaters. Cats maintain optimal health when their diet is made up of meat-based protein. Nature’s Variety are on a mission to help more cat owners include raw in their pet’s diet. For me, this shows their dedication to ensuring that cat’s get what they need to eat – meat-based products. Their products contain around 95% meat-based content, which is what all cats should be getting in their diet on a daily basis. Their range is convenient as well. Nature’s Variety have been clever in developing raw products that come in different forms. So, now there really is *no excuse* for not trying to add some raw food to your cat’s diet. ​When I fed Giles Nature’s Variety raw diets in the past, I just had to take the frozen meat out of the freezer a day or so before and serve it to him in his bowl. The measures are already done for you, so no need for mixing the raw food, which can become quite messy! There are lots of feeding guidelines on Nature’s Variety’s website, if have want to read more about portion control etc. The resources on their site are really useful, I particularly like the graphic that shows how cat owners should look to transition their cats onto a raw diet, over time. Personally, I have always tried to ensure that Giles is at the 75% raw level, but always struggled to get him there as he isn’t all that keen. ​It is quite odd, as other cats I have looked after absolutely love raw cat food diets. Anyway, instead of going down this route, I swear by a combination of other Natures Instinct products. 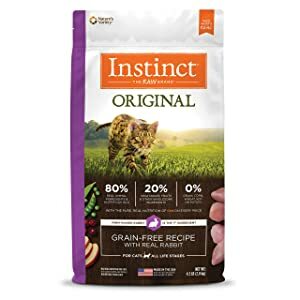 I mix the Instinct Grain-Free Rabbit Meal Dry Cat Food (25%) with the Nature’s Variety Instinct Grain-Free Canned Cat Food (75%), for the purrfect cat meal. ​All Nature’s Instinct kibble varieties are grain-free, gluten-free and free from any fillers. 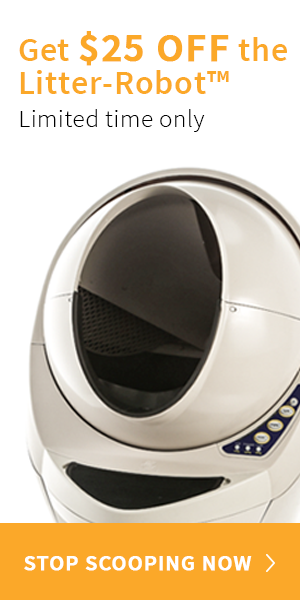 So, these products are great for ensuring that your cat is eating the most nutritious food. It is good to know the the company produces their cat food products in an owned manufacturing facility located in Lincoln, Nebraska. ​So, with lots of different products available in the Instinct range, which does Giles like best? This was a tough choice, but Giles tends to prefer rabbit/chicken over other meats, so for him it had to be these two products. I tend to buy both and mix them up in his diet, it works very well. Available in 5.1 lb and 11.3 lb bags. Expensive, but totally worth it in my opinion! In summary, I totally respect Nature’s Variety and their Instinct line of products. They are really pushing raw diets and have a fantastic set of products to offer cat owners who want to go raw, but are concerned about the time commitment. Their food is top notch and of the best quality. Like Weruva, their products contain no nasty ingredients. I spend a lot of my time looking at ingredients and researching brands so that I can pass my knowledge onto my visitors! If there are any specific brands that you want me to look into, just let me know below.